AAEA President Norris McDonald attended the "Major Economies Meeting on Energy and Climate Change at the U.S. Department of State. 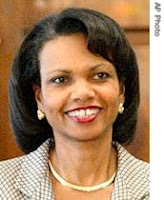 He is pictured at left with Secretary of State Condoleezza Rice. McDonald expressed AAEA's support for President Bush's climate change programs. He mentioned that AAEA is working hard on climate change mitigation and offered our organization's assistance to the State Department to assure the success of the administration's current effort. President Bush addressed the delegation at the State Department on the second day. McDonald attended the speech. He proposed a new International Clean Technology Fund that would help developing countries buy nuclear power plants, clean burning coal fired power plants and other technologies. The Congressional Black Caucus Foundation is hosting its 37th Annual Legislative Conference at the Washington Convention Center. Rep. James E. Clyburn, left, wil host the CBC Environmental Justice Forum, which will address, "Environmental Justice: Federal Efforts to Strengthen Environmental Justice Through Enforcement of Civil Rights," Friday, Sept 28, 2007, 10:30-12 noon, Room 143-B. The press, pundits, politicians, heads of state and armchair analysts are debating whether the United Nations meeting on climate change or the Bush Administration meeting on climate change will lead to the better solution. This is a very busy week for discussing climate change. AAEA believes there has to be some sort of hybrid with components from each point of view. President Bush is right that we should do nothing to destroy the American economy in attacking climate change and that technology can make a very big difference. But The United Nations is right in recommending some sort of cap and trade program. On one side President Bush opposes mandatory caps and on the other side the caps imposed by the Kyoto Protocol are not working. Kyoto obliges 35 industrial nations to cut emissions by at least 5 percent below 1990 levels by 2008-12. AAEA will participate in President Bush's meeting on climate change and will promote its technology-based solutions to climate change. We have developed a Green Carbon Bank and Carbon Mercantile Exchange to promote carbon dioxide offsets. We also support nuclear power and plug-in fuel cell hybrid (lithium ion battery) electric vehicles as the front line technologies to fight climate change. President Bush is promoting the Asia-Pacific Partnership and Methane-to-Markets as his lead programs to fight global climate change. The Bush will address the conferees (heads of 15 industrialised and developing countries) at the Sept. 27-28 conference, which will be hosted by Secretary of State Condoleezza Rice. Yvo de Boer, upper right, the head of the Bonn-based U.N. Climate Change Secretariat, will address the UN meeting on Monday, Sept 24. UN Secretary-General Ban Ki-moon, upper left, called for the conference of 100 government leaders to discuss climate change in New York, a day before the UN general assembly opens. The African American Environmentalist Association (AAEA) has been invited by the Bush Administration to participate in the international climate change summit that will include 16 nations. The summit will take place on Sept 27-28 and will be hosted by Secretary of State Condoleezza Rice. James L. Connaughton, Chairman of the White House Council on Environmental Quality and Mr. Yvo de Boer, Executive Secretary of the United Nations Framework Convention on Climate Change will give opening remarks. The summit will be held at the Department of State. President Bush relies on investment in new technologies, efficiency and flexibility in achieving global warming mitigation. AAEA will continue to promote technologies to reduce climate change. The Center for Environment, Commerce & Energy, AAEA's parent organization, recently traveled to China to tour facilities and promote new technologies. The conference will "seek agreement on the process by which the major economies would, by the end of 2008, agree upon a post 2012 framework," the expiration of the Kyoto Protocol. The following countries have been invited to send representatives to the summit: Australia, Brazil, Britain, Canada, China, France, Germany, India, Indonesia, Italy, Japan, Mexico, Russia, South Africa and South Korea. The Nuclear Energy Institute’s (NEI) Engineering Department has an immediate opening for a Project Manager (PM). The initial assignment will be to manage the regulatory interface on fire protection issues. Responsibilities will change over time in response to regulatory pressure, industry priorities, and personal experience and interests. Minimum requirements for the position are an engineering degree and at least 7 years experience in the nuclear industry. Other important attributes include nuclear plant systems experience, project manager experience and familiarity with fire protection related regulations.NEI works issues through a committee structure where the assigned PM manages the activities of a committee of industry experts who meet regularly with the NRC to achieve resolution of generic issues with regulatory significance. To apply, send your resume to resumes@nei.org. AAEA President Norris McDonald and AAEA New York Officer Director Dan Durett presented testimony before the U.S. Nuclear Regulatory Commission (NRC) on the License Renewal Application for the continued operation of Indian Point nuclear power plant located in Buchanan, New York. The NRC hearing was held on Sept 19, 2007 and included hundreds of participants. The vast majority of those attendees support the license renewal. The comments in support of the facility vastly outnumbered those in opposition. AAEA supports the relicensing of the plant to operate for twenty additional years beyond its current license. 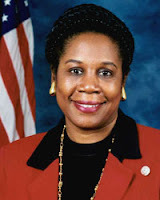 We must also mention an unfortunate incident that involved a long-haired environmental activist harassing Hazel Dukes, President of the New York State Chapter of the National Association for the Advancement of Colored People (NAACP) after her statement before the NRC. This is another recent example of how extremist environmentalists show extraordinary disrespect for Blacks who disagree with them. The New York Affordable, Reliable Electricity Alliance (NYAEA) recently arranged for AAEA to meet with Staten Island Borough President James Molinaro, left, to discuss his proposal to convert Fresh Kills landfill, which closed in 2001, into a wind farm. Fresh Kills was the world's largest landfill. AAEA agreed to support the project right after the briefing. This project is more important now because another proposed wind project on Long Island was cancelled this year. Arizona Sen. John McCain, former New York City mayor Rudy Giuliani and former Massachusetts governor Mitt Romney have declined to participate in the Sept. 27 debate at Morgan State University in Baltimore that will address issues of concern to African Americans. GOP candidates who will participate include Kansas Sen. Sam Brownback, former Arkansas governor Mike Huckabee, California Rep. Duncan Hunter, Texas Rep. Ron Paul and Colorado Rep. Tom Tancredo. Our respect for Mike Huckabee increases monthly. See Also: J.C. WATTS: "Does GOP care about the black vote?" PRESIDENT'S CORNER. By Norris McDonald. I call myself a practical environmentalist because, not only is life short, local communities and the planet are in dire need of environmental protection. Of course others call me other things but what else is new. Global warming is quite possibly beyond human capability to solve, but mitigation is possible. Humankind probably does not have the will to do what it takes to stop global warming. So we better learn to adapt. This puts more pressure on me to mitigate air pollution in Clean Air Act nonattainment areas. Higher temperatures will cook up a deadlier smog. And asthmatics like me will die sooner. And more people will develop breathing problems. I agree with the Declaration of Independence that we are endowed by our Creator with the unalienable rights of life, liberty and the pursuit of happiness. Global warming undermines, even destroys, these right. But what about personal 'feel good' practices? Is there anything wrong with them? Nope. Whatever gets you through the night. Will they reduce energy consumption or stop global warming? Nope. Purchasing a Prius can make you feel as though you are doing your part to help the planet, but many of the other people driving the 200 million cars and trucks do not feel the same way. Green building standards such as the Leadership in Environmental and Energy Design (LEED) make the building owners feel good, but will not reduce energy use because so many more buildings have to be built. Hotels, corporations and cities are now seeking 'feel good' programs for energy and environmental programs. Will they stop global warming? Nope. Draconian technological measures are the only path to mitigation. Capitalism does not always care about what is good for us. And I love capitalism. AAEA associates are working day and night trying to get practical solutions to our energy and environmental problems adopted. The answers are there, mostly in technology. It is working with decision-makers, America's military industrial commercial complex and public acceptance that will determine the technologies our society needs to be productive and environmentally friendly. We love promoting practical solutions to these problems. And I love being a practical environmentalist. Starting with the best known 'green' car - - the Toyoto Prius. Tavis Smiley will moderate the first ever Republican presidential debate aimed at issues of interest to African Americans on Sept 27. Of course many of those issues are the same as those of majority Americans, but there is a Black side of town in virtually every city in the U.S., so there are some issues that are unique to these communities. Moreover, more Whites should understand that the African American community is as American as apple pie. After all, Whites created it. The panel that will ask the questions for the debate will be comprised of: Cynthia Tucker of the Atlanta Journal-Constitution, Ray Suarez of PBS and NPR's Juan Williams. 1) Has the Bush administration been better than the Clinton administration on environmental issues? 2) Is environmental justice a legitimate issue to you? 3) Does environmental racism exist? 4) Has the Bush administration been better than the Clinton administration on environmental justice issues? 5) EPA lost a $600,000 racial discrimination lawsuit under the Clinton administration and a national law (NO FEAR Act) was signed by President Bush as a result of this situation, but the current EPA is still pursuing the complainant Marsha Coleman Adebayo. Would you settle with Ms. Adebayo or continue to pursue her? 6) Which sector is more segregated, the GOP or the environmental movement? 7) Is the Democratic Party friendlier to Blacks on environmental issues than the Republican Party? 8) Since there is a Black community in virtually every city in the United States, are there unique environmental issues in African American neighborhoods? 9) Why do you think Blacks do not own any part of the energy infrastructure in the United States? 10) Does global warming have a more serious impact on Black communities than majority communities? Does Black Culture Care About The Environment? "If you’ve been to: http://www.rsspect.org/, a syndication of many black blogs in the blogosphere, you’ll see that a majority talk about pop culture, politics, self-reflection, and culture uplifting. Of the 20+ blogs syndicated, you’ll notice that only one centers on the environment -- AAEA blog." The DC United soccer team is leading in the Eastern Standings. L. Emilio is leading the team in goals and C. Gomez is leading in assists. DC United deserves a new soccer stadium. Poplar Point is a great location for this development that would serve as an anchor for other economic development projects and environmental stewardship. This project could turn an area that is currently home to neglected land and pollution sites into a vibrant commercial and residential district. We also hope that it would prod the city and the federal government into supporting more reclamation of this untapped nugget East of the Anacostia River. Dr. Arjun Makhijani, left, president of the Institute for Energy and Environmental Research, is the author of a new study that says the U.S. could eliminate almost all of its carbon dioxide emissions by the year 2050. It also concludes that it is possible to do so without the use of nuclear power. The study, Carbon-Free and Nuclear-Free: A Roadmap for U.S. Energy Policy, was produced as a joint project of the Nuclear Policy Research Institute and the Institute for Energy and Environmental Research. 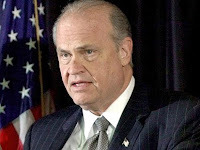 Fred Thompson, right, has a long history of supporting nuclear power. This means he is good on the global warming issue. He supported the Tennessee Clinch River Breeder Reactor. He seems like a visionary in retrospect. Bring it back. We need it now. He just announced his candidacy for the highest office in the land. If he wins we hope he will be more successful in the development of new nuclear power plants than he was with the breeder reactor. It was never built after big money was sunk into it. Hopefully he will also revisit breeder reactor technology. And to think our fearless leader lobbied against this technology way back in the early 1980s. Global warming was not on the radar back then either though. Do you anticipate that nuclear energy will provide some solutions to higher energy prices? China and India are building nuclear plants, and they have a large number of new plants planned for the future. Do you favor this form of energy? CONGRESSMAN PAUL: I think it will come. I think it is a good answer. I have a nuclear power plant in my district. It is another answer when energy prices go too high. I think we are going to win on that issue, although we have lost for a good many years, and there have not been any new nuclear power plants. When push comes to shove, I think the American people are going to say, "I want my house heated and lit up with electricity." So I think we are finally going to reject some of these arguments against nuclear power, because they are not very convincing." Is Carbon Offsetting Just Eco-Enslavement? Author Brendan O'Neill makes the case in "Spiked" that the rich buying carbon dioxide offsets to continue their energy use while folks in developing countries are encouraged to use human labor to get things done amounts to 'eco-enslavement.' Interesting postulation. Click on the Penguin for our take on this. Ever think there are problems beyond the capability of humans to manage or solve? American racial integration comes to mind. Maybe climate change is another. Try as we might, these problems are simply extremely complex to solve. A new 184-page GAO report commissioned by Senators John McCain (R-AZ) and John Kerry (D Mass) in 2004 says the federal government could do a better job on addressing climate change. The report says fed gov managers "have limited guidance about how to address climate change and without such guidance their ability to address climate change...is constrained." Where Are Environmentalists Who Support Nuclear Power? The Nuclear Energy Institute has a long list of environmentalists on its new website who express their support for nuclear power. Unfortunately, AAEA has not seen them out on the field of battle. Where are they? Are they, as Bill Maher said that got him fired from his "Politically Incorrect" show, safely launching missiles from 2,000 miles away? As marines on the front lines of battle, we have not seen them. The surge is working, but those of us who have been deployed since the beginning of this war would like to see some backup. If you're gonna talk the talk then walk the walk. Come on out. We could use the help. The groups listed are not shy about battle. When they support (rare in the environemental movement) or oppose a cause, they normally put massive resources into the effort. Their support for nuclear power seems tepid at best. While we are out avoiding IEDs and snipers, others seem to think this war can be won from the safety of their ivory towers. The anti nukers are out there table-bombing hearings with their leaflets and propaganda. They are also making amazingly imaginative statements during these hearings and meetings. America's energy future is at stake here. And while some armchair 'environmentalists' get the headlines and credit, AAEA will remain on the front lines advancing the global warming battles and fighting the real energy war. Big buyout firms, represented by the Private Equity Council (PEC), are fighting a proposal to raise the tax rate on private equity profits. And they are getting help from a new minority group coalition called the Access To Capital Coalition (ACC) that also opposes raising the tax rate on carried interest, which comprises most of private equity fund managers’ earnings. The ACC receives funding from the PEC and includes Magic Johnson and Robert Johnson. The 21-member Asia-Pacific Economic Cooperation (APEC) forum is meeting in Sydney, Australia to discuss, among other things, global warming. APEC will call for major emitters to make measurable and verifiable contributions to meeting shared global greenhouse gas reduction goals. APEC will call for voluntary measures that promote the use of energy efficiency, forest protection and increased spending on cleaner forms of energy like wind and nuclear power. The National Association of Manufacturers (NAM) and the U.S. Chamber of Commerce took out a full page ad in The Washington Post today opposing the energy bill pending in Congress. NAM and the Chamber believe the legislation will "raise costs, put Americans out of work and limit the nation's access to domestic energy supplies." Their opposition is to tax hike and gasoline price control provisions. They believe these provisions will, "raise energy costs for American consumers, manufacturere and businesses, hurting economic growth and driving high-paying American jobs overseas." They also believe the bill will increase our reliance on foreign sources of energy. AAEA President Norris McDonald, left, is quoted on environmental justice in The New York Times Magazine (9-2-07) in an article entitled, "Not in Whose Backyard?" The article is written by Amanda Griscom Little, contributor to Outside magazine and Grist.org. Ms. Griscom Little is writing a book about energy in the United States. Victor B. MacFarlane, right, president of McFarlane Partners, has partnered with The JBG Companies to form JBG Urban LLC develop and redevelop properties in the Washington area. 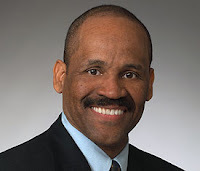 McFarlane Partners is the largest minority-owned real estate investment firm in the country. MacFarlane also purchased the DC United soccer and is trying to build a new soccer stadium for the team across the river from the new National's baseball team stadium.